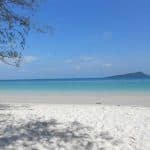 The last time the Visit Koh Rong team stayed on Koh Touch – the main tourist area on Koh Rong Island – we decided to try out Paradise Bungalows. 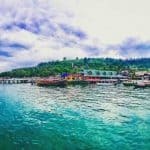 The bungalows are located a short 10 min walk away from the main bars, restaurants, and night clubs (head right as you get off the ferry). In my opinion this is the best area on Koh Touch, as you are just far enough away to not be bothered by night time noise, while the beach is cleaner, quieter, and more beautiful. 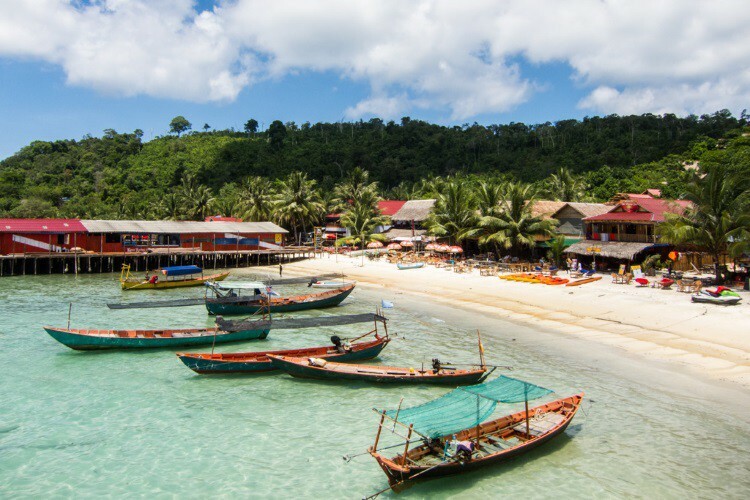 The bungalows themselves are quite rustic-looking, but when it comes to the general standards on Koh Touch, they are up there with the better options. We stayed in a bungalow designed for 2 couples – There were 2 (reasonably spacious) adjacent rooms and a shared bathroom with an outside shower. The outside shower is enclosed by high walls so you don’t have to worry about being seen. 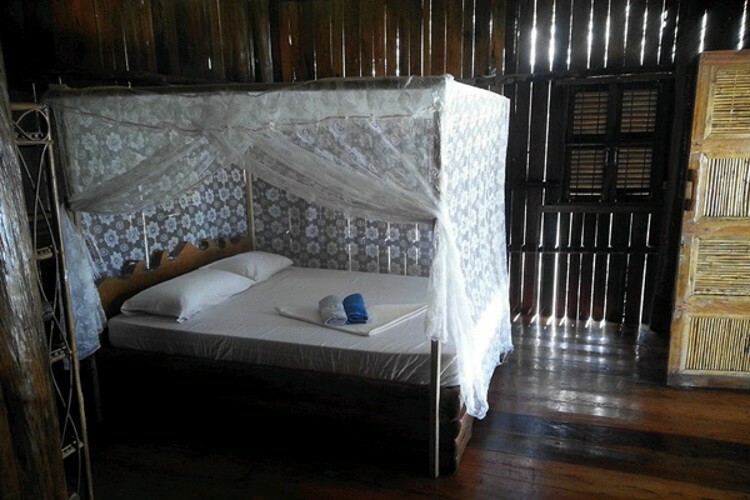 The rooms were clean and well-kept, and each bed came with a fan and a mosquito net. As with most hotels on Koh Touch, the rooms aren’t designed to be sound proof, so bare that in mind if you’re looking to share a bungalow. 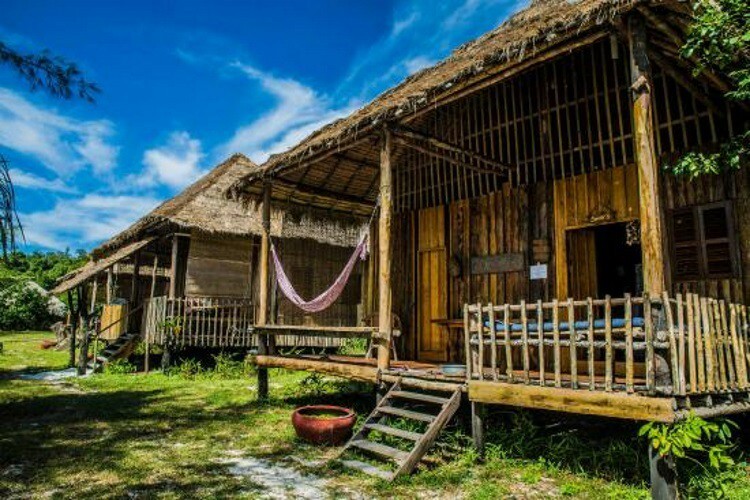 All in all I’d say the bungalows are of a pretty good standard for Koh Touch – Remember you’ll only really be using them for sleeping, so as long as you have a fan, some clean sheets, and a mosquito net you’ll be fine. 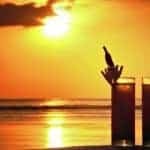 The extra you pay for with Paradise Bungalows (our 4-person bungalow was $80 / night) is an extra level of privacy and comfort, and, of course, easy access to the best part of the beach. Now for the things you need to be prepared for… Firstly, the electricity in the bungalows switches off at 6am, so there’s no chance of a lie in as it gets very hot after that. If you’re the kind of person who likes to get up early and make the most of the sunshine, then this won’t bother you too much. However, if you’re more of a night time dweller, I’d definitely recommend you stay elsewhere. Secondly, make sure you ask the staff to clean your rooms when you go out or they will not be cleaned. Nobody told us this when we arrived, and although there are instructions in the rooms, we didn’t have the time to study them in detail as we were very busy. Finally, some of the staff were a little difficult on our visit, but this might just have been specific to our stay. In general, please remember to try to keep patient with the Khmer, as many of them are not used to western standards and logics. Otherwise, lie back and enjoy the beautiful scenery!